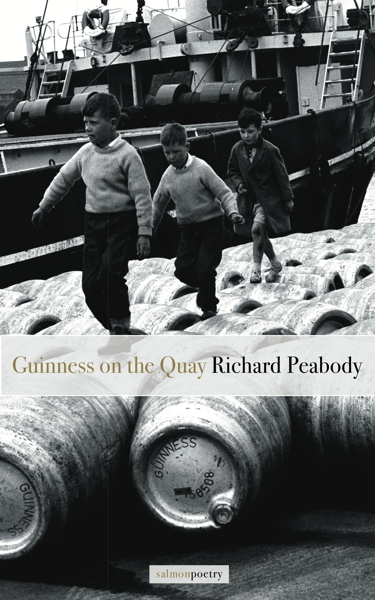 In Guinness on the Quay, Peabody urges the questions of what makes the contemporary landscape, the totems, myths, meccas that we share. This is a mature voice singing life observed, life lived as a poem forever becoming embodied, in lines that reveal the deeply personal. Writing the moment, mining a timeless effect, the poet shows how the U.S. is a heart that longs for distillation, as Yeats’ writing desk meets the radioactive spiders of Three Mile Island. Joy and humor join all our fears in Peabody’s dazzling new collection. Richard Peabody is amongst the finest poets to so astutely capture the heart and soul of the American spirit in these original poems. His use of imagery, metaphor and humor all come together to create a totally unique and original style of poetry that takes into account everything from The Clash to postmodern poetry and Jimi Hendrix to William Butler Yeats. Mr. Peabody offers readers engaging and thought provoking poems that shakes the genre and rattles with words. This poet rocks! He knows the underside, the topside and the in-between of this American life. His poems succinctly capture the fine details and subtle nuances of what it is to be American. The poems in this collection will keep you returning for more and more. Richard Peabody has been writing beautifully crafted poems like this for years, and with this great collection, he shows no sign of stopping anytime soon. Richard Peabody is a native of Washington, D.C. He holds degrees from the University of Maryland and the American University. Some earlier poetry collections are I’m in Love with the Morton Salt Girl, Sad Fashions, Mood Vertigo, and Speed Enforced by Aircraft. He is the remaining founding editor of Gargoyle Magazine (established in 1976) and editor (or co-editor) of 20+ anthologies including Mondo Barbie, Mondo Elvis, Conversations with Gore Vidal, and A Different Beat: Writings by Women of the Beat Generation. The author of a novella and three short story collections, he taught graduate fiction writing at Johns Hopkins University for fifteen years. His most recent book is The Richard Peabody Reader (Alan Squire Publishers, 2015). Anthology credits include: Dogs Singing: A Tribute Anthology (Salmon Poetry), Short Fuse: The Global Anthology of New Fusion Poetry (Ratapallax Press), 100 Poets Against the War (Salt Publishing), Poetic Voices Without Borders (Gival Press), Working Words: A Working Class and Labor Literature Reader (Coffeehouse), In the Criminal’s Cabinet (nthposition), Stories of Our Landmined World (EJP), and The Incredible Sestina Anthology (Write Bloody Publishing). You can find him at www.gargoylemagazine.com.